After a long day at the office, you yearn for a night of much-needed rest. You’re tired, sleepy, and waiting for that very precious moment when your head finally hits the pillow. But it doesn’t go like that; you find yourself through endless to-do lists and remembering past conversations, all of this getting you further from your goal: a good night’s sleep. Around the world, millions of people have bad sleeping habits, which impact their lifestyle and well-being. So what’s the solution? The best natural sleep aid for cleansing your mind from negative thoughts while ensuring full relaxation is sleep meditation. We all know when someone is asleep, don’t we? Yet, can we actually define what sleep actually is? For many, sleeping is simply a time when the body and the brain shut down for a few hours each night in order to rest and prepare for the following day. But in fact, sleep means much more, as scientists have proven that neither the body nor the brain shuts off completely when we sleep. In reality, they join forces to work even harder by undergoing processes to improve health, restore cells, and process information. Sleep consists of two main phases — REM (rapid eye movement) and non-REM. We spend nearly a quarter of our sleeping lives in the REM phase, which is known to be a period of potent brain activity, marked by those lucid dreams we are able to remember the next morning. Apart from giving us fantastic or strange dream sequences, this phase is responsible for processing memories and consolidating information. Ever wondered why babies sleep so much? Well, it is because their entire days are full of brand new experience their brains need to process. The non-REM sleep is believed to have three distinctive stages. These phases grow gradually deeper throughout the night until it becomes really hard to be disturbed from our precious sleep. During this time, the body works to lower the heart rate, breathing rate, and temperature. Although there have been many discoveries about sleep, this phenomenon still remains surrounded by mystery. Scientists have struggled to pinpoint a concrete reason as to why animals and human beings need to sleep every night. Yet, it is safe to say that sleeping, apart from being extremely pleasing, offers the body a chance to recover from daily life and facilitates functions such as memory and learning. We tend to think of sleeping as merely a time when our bodies and brains shut off temporarily. In reality, good sleeping habits are just as important as healthy eating or regular exercising. When we rest, the brain is working hard overseeing a variety of biological functions and getting our bodies ready for the following day. The National Sleep Foundation states: “sleep is a vital indicator of overall health and well-being.” Human beings spend up to one-third of our lives asleep. The overall state of our sleep health remains an essential factor throughout our lifetime. Researches at the foundation determined that adults between the ages of 18 and 64 should sleep 7 to 9 hours daily. Your friend or colleague who is always alert and recalls anything they read or hear may be an excellent sleeper. This is because a good night’s’ sleep is particularly beneficial for memory, emotions, and for making connections between events. For example, when you are awake, your mind captures small snapshots of your everyday-life experiences — what you read, hear or say during a meeting or a lecture. Then, as you sleep, the brain replays these events just like videos. Furthermore, it builds new neuron connections to transform the experiences into long-term memories that you are able to remember even weeks and weeks later. It’s no secret that we think better when we are well rested. After all, an alert brain allows us to remain focused, learn, process information, and be more creative. Sleep can trigger changes in the brain that solidify memories, strengthening connections between cells and transferring information from one brain hemisphere to another. Scientists specialized in sleeping patterns believe that, while we sleep, our memories and skills shift to more efficient and permanent brain regions, enhancing proficiency the next day. In fact, research indicates that when people learn before going to sleep or nap, they remember information better in the long term. Are you tired of yo-yo diets, exercise, and slimming shakes? You might as well try going to bed earlier to get that dream figure. Science has proven that those who enjoy deep, restful sleep are more likely to be in shape and stick to healthy eating habits. Researches at the University of Chicago proved that well rested dieters lost more fat (56% of their weight loss) than those who were sleep deprived, who ended up losing more muscle mass. What’s more, dieters who got less sleep time felt hungrier. Stuck up on naps! Although sleeping more won’t necessarily prevent you from getting sick, skimping on it can impact your immune system, leaving you vulnerable to the flu or a tough cold. This happens because, without sufficient sleep, your body produces fewer cytokines. The former are a special kind of proteins produced and released when you are asleep. Cytokines are known for targeting inflammation and infection, effectively creating an immune response. What’s more useful than the ability to interact socially and recognize people’s emotions? Good sleep helps you maximize this superpower. This comes particularly handy for your personal relationships and development at work. Just imagine reading a customer’s or a colleague’s emotions perfectly. This can be possible when your attention is at a 100% capacity after a good night’s sleep. In fact, several studies have confirmed, through facial recognition tests, that well-rested people are better at recognizing important social cues and emotional information. Researches at the University of California suggest that this is because sleep problems impair discrete, affective neural systems, disrupting the identification of affective social cues. Although deep restful sleep is just as important as eating, drinking water or exercising, many people don’t see it as a priority. You might know that friend or colleague who believes “sleeping is for the dead” or if you snooze, you lose. Or perhaps you are that person who prides himself or herself about the ability to perfectly functioning with barely 3 or 5 hours of sleep. The truth is that, in the 21st century, many of us have forgotten what good sleep is truly like. The numbers only confirm this reality. In 2014, it was reported that over 40% of adults in America slept fewer than 7 hours per night. According to a recent poll, 30% of people have experienced trouble sleeping a few times per month. And, around 6% experience insomnia on a near-nightly basis. This problem has become so severe that people around the world are spending almost $75 billion on sleep-aids this year. Making sleep a priority is particularly difficult in a world dominated by stimulants such as coffee, energy drinks, and even factors like alarm clocks, the sounds of busy streets, and external lights. The use of electronic devices complicates things more as they interfere with our circadian rhythm or natural sleep/week cycle. Of course, most of the sleep-deprived people are not happy with their situations and don’t sleep because they don’t want to. We know how it goes; sometimes, we cannot fall asleep or stay asleep due to biological forces and lifestyle choices. It could be that the moment your head hits the pillow, your mind suddenly starts racing. Why? You might wonder. Well, in fact, those thoughts have always been there, however, without distractions, you become more aware of them. If you would like to dig more into the specific factors that prevent you for a perfect night’s sleep, these might be the following. Increased sleep deprivation or sleep deficit has been linked to the growth of social media and technology. Are you spending more and more time connected to Instagram or Facebook through your smartphone, computer, and apps? If that’s the case, you aren’t the only one. Data from Pew Research Center has revealed that the use of social media amongst adults has soared from 5% in 2005 to an alarming 69% in 2018. And although social media has its perks, it can also affect your sleeping habits. It is easy to become addicted to watching YouTube clips or scrolling down your Facebook news feed at 2 AM in the morning. Unaware of this addiction, many people sacrifice their sleeping time in favor of being online. A study published at Oxford University Press found that adults who use social media for more than two hours per day are twice as likely to have sleep problems compared to those who use social media merely 30 minutes per day. How long do you lie in bed, worrying and feeling anxious about today or tomorrow? Perhaps minutes or even hours. When an abundance of thoughts floods your minds, it’s almost impossible to relax and quiet your mind enough to fall asleep. In our fast-paced global society, the pressures of everyday life expose us to high doses of stress and anxiety. Unfortunately, if you are not getting a good night’s, the body automatically boost its levels of a stress hormone called cortisol. No wonder that, when you don’t sleep well, you feel more stressed and sensitive. If you have spent the night tossing, turning, and with a mind full of racing thoughts, you already know how it will go the next day — you are grumpy, sore and out of energy. Other typical short-term effects of sleep deprivation include excessive sleepiness, yawning, irritability, and daytime fatigue. However, missing out your average 7 to 9 hours of sleep per night affects much more than just your general mood. The long-term effects of lack of sleep are very real. Not only does it drain your mental abilities, but it also puts your physical health at risk. Study after study has confirmed that those who sleep poorly are at greater risk for a number of diseases and health problems. The cardiovascular system in particular is deeply affected, as the amount of sleep you get affects the health of your blood vessels — blood sugar, inflammation levels, and blood pressure. For instance, you could be at risk of cardiovascular disease and coronary heart disease regardless of age, weight, exercise or smoking habits. Other long-term consequences include obesity, respiratory problems, weak immune system, digestion problems, and many more. Overall, too little or too much sleep is associated with a shorter life span, although there is still a lot of research to be done in the field. To avoid the non-term effects of sleep deprivation and improve the quality of life, there are a number of things that can be done. One of them is a natural and highly effective practice known as sleep meditation, which acts as your personal guide into the dreamland. What is meditation for sleep? If you have spent restless nights recapping events of the day or going through your endless to-do lists, there is a solution. It’s not sleeping pills or hypnosis, but rather sleep meditation – a powerful method for reducing sleepless nights by training the mind to be less stuck in racing thoughts and being more aware of the present moment. Once we hit our pillows, racing thoughts and worries begin to flood our minds. Luckily, meditative practices are able to control them. When talking about deep sleep meditation in specific, we’re referring to an ancient technique that produces a state of deep relaxation. It is called Yoga Nidra, which in Sanskrit, means sleep. Those who wish to achieve a relaxed mind and body in a holistic way are often drawn to meditation for sleep. The experience of sleep meditation usually involves a journey that offers a natural sleep aid, allowing us to let go of the day — everything that has happened at work and every conversation you might have had — so the mind is able to rest while simultaneously resting the body. Scientifically speaking, meditation helps our bodies by lowering the heart rate through the ignition of the parasympathetic nervous system. This leads to a deep relaxation state, which encourages lower breathing, hence maximizing the quality of a good night’s sleep. What many people don’t know is that there is a difference between being asleep and sleep meditation. When we are asleep, our nervous system remains relatively inactive. During what is known as the Rapid Eye Movement phase or REM sleep, our consciousness is basically on stand by. You are obviously not awake and not aware of what is happening around you. You are not present in the moment. Most dreams occur in the REM state. On the other hand, sleep meditation is a mind-calming practice that takes place whenever you are fully awake (though deeply relaxed), and your conscious mind is active. This means that you are fully aware of what is happening; you are consciously in the moment and you are able to control your thoughts. What sleep and sleep meditation do have in common is the capacity of deeply relaxing the body and producing low-frequency brain waves. Both processes unlock many benefits, which science has managed to explain over the last decades. For years, science has studied the relationship between meditation and better sleep. Practitioners of Transcendental Meditation first reported the effects of meditation on sleep in 1997. The study reported that those senior meditators were able to spend more time in slow wave sleep. It was also found that rapid eye movement (REM) was enhanced. This was considered to be a stabilized state of higher consciousness in sleep. A recent study published in JAMA Internal Medicine included 49 middle-aged participants who had trouble falling asleep. Half completed a mindfulness-awareness program, which taught them meditation and other mindfulness exercises designed to help them concentrate on moment-by-moment experiences, thoughts, and emotions. Meanwhile, the other half completed a sleep meditation class that educated them in ways to improve sleeping habits. The study organized group meetings, once a week for approximately two hours. Compared with the group that attended the sleep education class, the group of meditators experienced less insomnia, depression, and fatigue at the end of the six sessions. The outstanding results were not a surprise for Dr. Herbert Benson, director emeritus of the Harvard-affiliated Benson-Henry Institute for Mind Body Medicine. “Mindfulness meditation is just one of a smorgasbord of techniques that evoke the relaxation response,” he said. If you wish to find out how to get better sleep, there are many things you can do. For instance, performing meditation for sleep practices at night might encourage a more restful sleep depending on the person. Does this mean you have to clear your mind of all thoughts? Absolutely not! On the contrary, practicing mindfulness meditation represents the opposite. It means focusing your mind on the present moment, being aware of every breath you take and paying close attention to your body. If you find this difficult or you are totally clueless about how to start, try out focusing on your toes at first. Flex and relax the muscles of your toes slowly as you focus your mind from one part of your body to the next one. This might sound like a piece of cake, but in fact, many people struggle to concentrate and control running thoughts through their heads. However, don’t forget that practice makes perfect. Focusing your energy on your breath and spreading awareness to the rest of your body will eventually become easier with time. This is another popular sleep meditation method, which requires focusing your attention on a single thing. It could either be a physical object such as the flame of a candle or a single thought or images that bring you peace. You could also try out reciting your favorite mantra throughout the meditation. If you have never tried concentration meditation before, you could simply focus on the sensation of your breath and allow each inhalation to slowly flow through your body. Since your breathing is a constant companion, it may be much easier to focus solely on it. It could be that you don’t have the time to try out mindfulness meditation and concentration meditation or perhaps it doesn’t seem appealing. Fear not! There are plenty of easy and quick meditations you can put into practice in order to get that well-deserved sleep time. For example, you could count backward from 100 once you are lying down on your bed. Make sure to restart every time you lose time. If you forgot the number, just start all over again and continue with the count down. Opt for breathing exercises also known as Pranayama or yoga breathing, which are all about the way we breathe. Inhale and exhale through your nostrils only. Let the air drag over the back of your throat creating a low, ocean-like sound on the inhale and exhale. Once you are all warmed up, continue into square breathing. In other words, inhale for four counts, hold for two and exhale for four. Repeat this simple exercise for two to three minutes. Did you know that Synctuition represents the culmination of a decade of work by the world’s leading neurologists, psychologists, musicians, and meditation experts? And it doesn’t end there; years of research and development have made Synctuition the most effective and non-invasive method for helping you fall asleep, providing your body and mind with much-needed rest. The Synctuition team has analyzed the latest research on stress and audio therapy to isolate the sounds that work best to calm the mind. Based on this research, the team spent years recording and composing Synctuition’s 60 audio journeys in order to form the absolutely perfect formula of relaxing and meditative sounds. The result: a groundbreaking and unique new soundwave that acts as an antivirus for the mind, cleansing, relaxing and resetting your thoughts. By helping you to become the best version of yourself, it improves your quality of sleep, reducing stress and anxiety, enhancing your focus and creativity with so many additional benefits. Unlike other meditation programs on the market, Synctuition stimulates the brain and uses its natural neuroplasticity to create millions of new synapses that provide for increased creativity, enhanced intuition and better decision making. This increased brain connectivity helps to keep the brain refreshed and the mind rejuvenated. 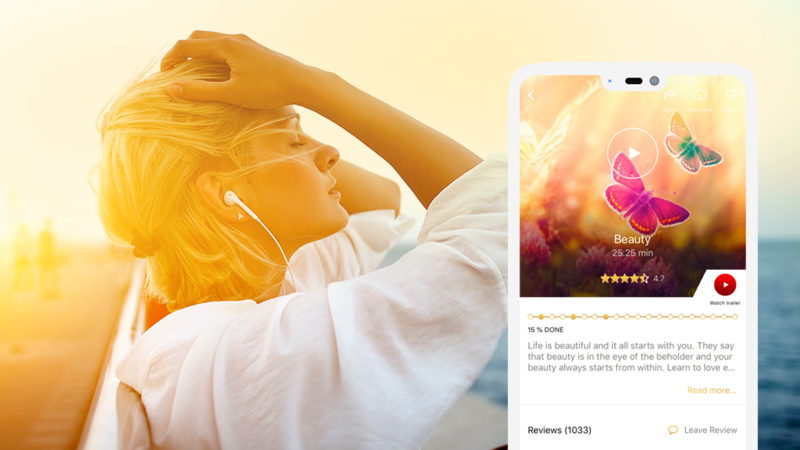 Synctuition is the first and only deep relaxation system that combines binaural beats, gamma waves and 3D audio soundscapes that soothe the mind. The binaural beats are used in a very specific frequency range, where its effects are at their greatest, to synchronize the brain and relax the body. This magical frequency range is called the Gamma (~40Hz) range. A very interesting fact is that only highly disciplined monks who have been practicing intense prayer for decades have shown the ability to naturally move their brainwaves into the Gamma range for an extended period of time. Until now, no one has been able to successfully use this powerful brain frequency in a manner that sounds pleasant to the human ear, mimicking our brain’s natural pre-sleep frequency, that gentle vibration we feel as we drift off to sleep. Whenever we go to bed, our brain processes everything we have experienced during the day, and transfers it to long-term memory during sleep. This is why, when you don’t allow negative experiences to be properly processed, the negative energy remains in your thoughts and you feel grumpy and tired in the morning. By clearing off all the negative emotions from your mind before bedtime, Synctuition prepares your mind and body for a good night’s sleep. It works exactly like a mind spa. You will clear your mind of negative and toxic events before going to sleep and wake up to a refreshing morning full of positive energy. 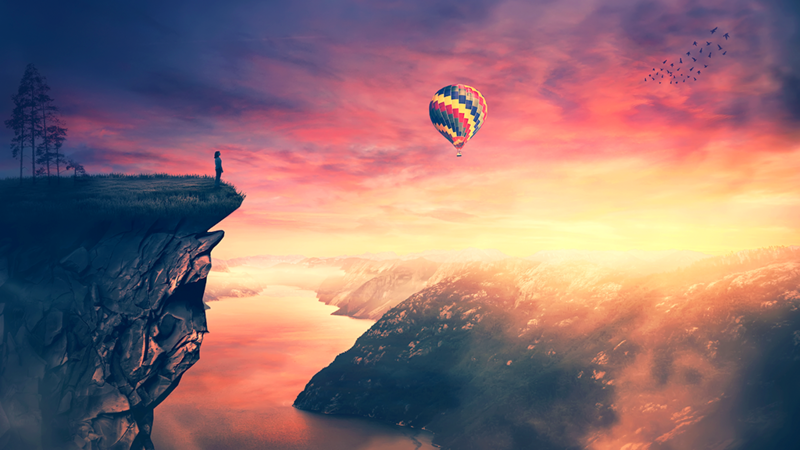 The combination of over 13000 amazing and beautiful sounds, mesmerizing music from over 2000 exotic places around the world, and soothing binaural beats in the background, will help to put your mind in the ideal state for deep sleep. Synctuition’s unique combination of 3D meditation and binaural beats have been proven to raise levels of melatonin, the hormone responsible for sleep. When you make a habit of using Synctuition every night as part of your bedtime routine, you will establish a habit of good sleep. Each Synctuition track is a vivid mind journey that positively stimulates the imagination. You can go anywhere in the universe without leaving the comfort of your chair, explore the unknown or go on an immersive journey within to see your life from a completely different angle. Your mind will experience a vivid movie that is made by your imagination showcasing images that are unique and deeply meaningful to your life. The Synctuition mind travel experience is an unforgettable adventure that provides stress relief, mental clarity and self-knowledge. Treating yourself to a 25-minute Synctuition journey— the equivalent of 4 hours of deep meditation — as part of your preparation for sleep each night means that you give yourself a positive mental shower. This is ultimately the perfect way for getting rid of feelings of anxiety and helping your mind to relax and unwind before you go to bed. And the best thing? It is a truly natural, non-invasive way to sleep better. Ready for deep sleep meditation? Deep relaxation is the key to achieving a well-deserved deep restorative sleep. Good sleep habits have been proven to carry many health benefits that allow us to function more efficiently and live a longer, more prosperous life. In order to experience the many benefits of sleep, the best thing you can do is begin the fulfilling journey of guided sleep meditation. Synctuition’s audio technology has been designed with the purpose of helping you sleep better and improve your quality of life.